Vote forApollo Bay, VICTop Regional Destinations Which are Australia's must-visit destinations? You help us decide. One of the key stops on the marvellous Great Ocean Road, Victoria's Apollo Bay exudes charm along with an escapist, relaxed feel. The small town sits in an idyllic location that blends together the best of coast and greenery, with the lushness of the Otways as a nearby backdrop and a wide, sweeping beach just a short walk away. Why it's special: A picturesque seaside village with plenty to offer. Located on the world famous Great Ocean Road, Apollo Bay has a genuine seafood culture embraced by tranquil beaches, rolling green hills and a national park at its door step. While there are numerous lovely towns along the Great Ocean Road that each have their own individual quirks and allure, Apollo Bay is a standout in its own right, with its gorgeous beaches, bountiful seafood, and numerous walking opportunities nearby while still maintaining a peaceful and quiet atmosphere outside all but the busiest of seasons. The town sits around halfway along this most epic of Australian drives, and can be used both as an overnight springboard before pressing onwards to see the rest of the Great Ocean Road's highlights, or as a multi-day base from which to launch expeditions into the Otways, or simply laze on the waterfront. As a result, the experiences on offer at Apollo Bay are not only enjoyable, but often able to be had all to yourself; embarking on one of the multiple delightful rainforest walks nearby is an extra kind of magical when a dash of solitude is added. The setting of the town is what truly makes it special, with green hills that extend all the way to the ocean, where its beach forms the focal point of activity for both adults and kids alike. The beach area boasts a wonderful playground that little ones will love, while adults looking for an additional touch of romance can instead opt to hop on horseback and experience a magical ride on the waterfront. The town provides the ideal natural springboard from which to experience the wonders of the Otways; a natural wonderland with lush green forest and the ferocious Southern Ocean. Visitors can choose from a range of walking trails that show off the spectacular scenery and start exploring. The Otways are fertile farmlands. The rich soil of The Otways region provides some of Victoria’s best produce and allow visitors the chance to travel along the local farm-gate trails and fill up their picnic basket. They can spend a morning wandering around a local village market and support the region’s producers, and almost everyone is bound to leave with a bag full of fresh organic goodies. The town of Apollo Bay itself is no slouch, either, with a number of lovely little craft stores, galleries and cafes, as well as the expected seafood restaurants which capitalise on the ample fishing to be had in the adjacent ocean to full effect. Lastly, if you're wanting "dinner with a view" throughout your travels, there are few better spots in which to enjoy such a meal than here. Apollo Bay also has one other key selling point that helps separate it from some of its coastal brethren: the town also serves as the launching point for one of Australia's most incredible foot-based journeys: the Great Ocean Walk. With its iconic, incredible examples of dramatic coastal scenery, rocky cliff faces and vast stretches of open beach, what may be one of the world's most beautiful drives also makes for one of the country's essential walks. Looking to pay a visit to Apollo Bay but not sure what to do? Here are a few of its most essential experiences. What's new in Apollo Bay in 2017/2018? There's another vibrant calendar of events set to take place, from an international marathon to the new WinterWild; Apollo Bay's newest addition to the calendar during the winter season. 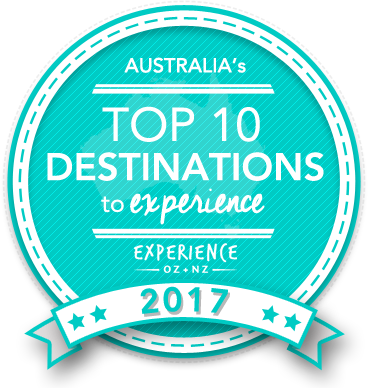 Is Apollo Bay Australia's Top Regional Destination to Experience for 2017? Vote now for the chance to WIN an epic trip to one of Australia's top destinations!